We are pleased that State Assembly Speaker Anthony Rendon recently bragged in a tweet that led with the fact California has the most manufacturing jobs in the nation. We should be proud that manufacturing plays such a crucial role in the California and US economies. As advocates for manufacturing, we regularly remind elected officials that not only do manufacturers represent more than 1.2 million jobs in that sector, but they also support many more jobs in other sectors of the economy, with a multiplier of 2.5 jobs for every one manufacturing job. The debates leading up to last November’s national election included urgent calls for bringing back high-wage, middle-class manufacturing jobs to the U.S. The average California manufacturing wage, not including healthcare and other benefits, is $83k per year. California will compete with other states to attract its fair share of these highly valued jobs and the new investments that generate them as new industries develop and some jobs 'reshore' from overseas. 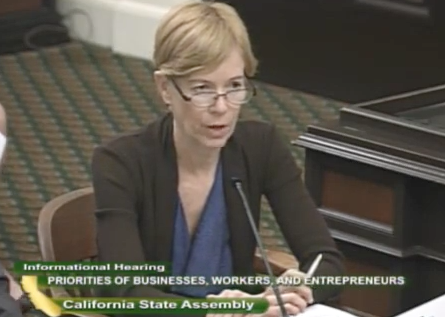 This week Avdis and her Go-BIZ counterparts also highlighted California's manufacturing size in a legislative informational hearing on California's core economic topics. Successfully recruiting and growing new manufacturers is a hopeful sign and we need the continued time and attention by state policymakers to keep it up. The hill to climb is shown in the 2015 manufacturing investment data, the last year available, when we attracted only 1.5% of the manufacturing investment in the US. We can improve our performance by funding skilled workforce development, enacting pro-growth tax policies and fixing regulations to lower costs of compliance and speed up permitting processes, while protecting public health and the environment. It’s exciting that our state is working hard to recruit manufacturing and that leaders are highlighting the state’s manufacturing economy. 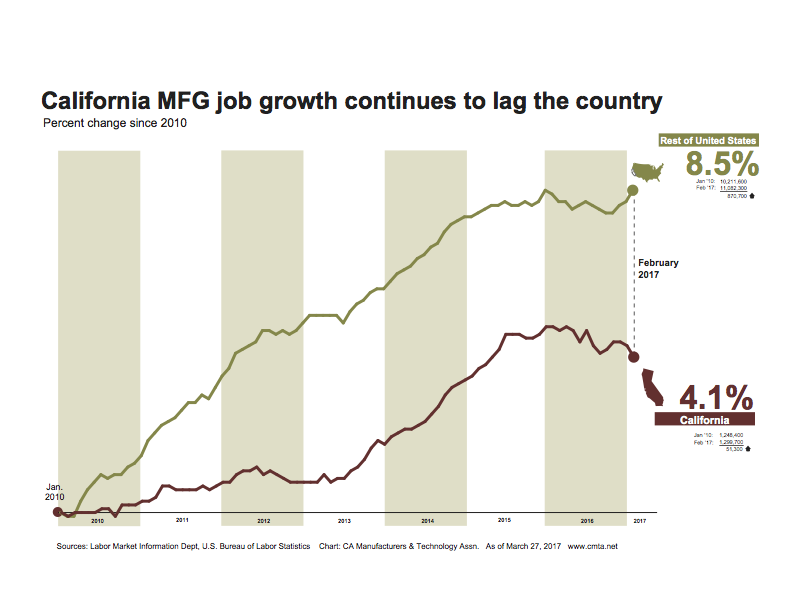 Let’s channel this momentum into a movement to catch-up to and even outpace the rest of the country with a California surge in new manufacturing jobs and investments.